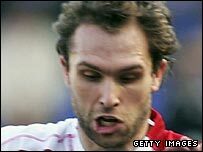 Watford have signed Stoke captain John Eustace on a two-and-a-half year contract for a fee of £250,000. The 28-year-old central midfielder is the Hornets' fourth signing of the January transfer window. He began his career as a trainee at Coventry before loan spells with Dundee United and Middlesbrough. He joined Stoke in July, 2003 and despite suffering a spate of injuries, he signed a one-year contract extension at the Britannia Stadium in July, 2007.